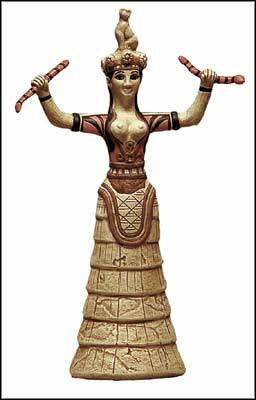 Minoan snake goddess, snake goddess, goddesses, goddess, minoan, goddess statues. Herakleion Museum, Crete, Greece. 1600 B.C. This figurine represents an agricultural fertility Goddess or her Priestess. The original was found in a storage room in the Palace of Knossos, Crete. She is a votive offering and not a cult figure and therefore, probably represents a Priestess who is perhaps a princess of the palace. Although she is dressed in the garb of her deity, a Cretan Earth Mother, she is a personification of Earth from which all life springs and returns. She carries the snakes, symbols of death and rebirth. Crouching on her crown is a lion cub, usually associated with royal houses. In her crown are poppy pods, indicating the use of opium in her worship.